It is in the cart of 2 users. It is in the wishlist of 11 users. It is owned by 2 users. It has been viewed 1087 times. 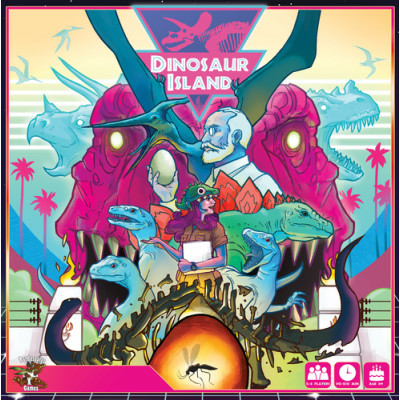 Dinosaur Island is a game from designers Jon Gilmour (Dead of Winter, Wasteland Express Delivery Service) and Brian Lewis (Titans of Industry) from Pandasaurus Games (Machi Koro, Yedo, Wasteland Express Delivery Service) with amazing, technicolor, ridiculously 90s artwork from Kwanchai Moriya and Peter Wocken. In Dinosaur Island, players will have to collect DNA, research the DNA sequences of extinct dinosaur species and then combine the ancient DNA in the correct sequence to bring these prehistoric creatures back to life. Dino cooking! All players will compete to build the most thrilling park each season, and then work to attract (and keep alive!) the most guests each season that the park opens. Do you go big and create a pack of Velociraptors? They'll definitely excite potential guests, but you'd better make a large enough enclosure for them. And maybe hire some (read: a lot of) security. Or they WILL break out and start eating your guests, and we all know how that ends. You could play it safe and grow a bunch of herbivores, but then you aren't going to have the most exciting park in the world (sad face). So maybe buy a roller coaster or two to try and attract guests to your park the good old fashioned way? Login and suggest cards' format!